Two months into the start of a new coffee-growing season, coffee rust is still destroying coffee crops and the dreams of coffee farmers hoping for a better harvest than last year. 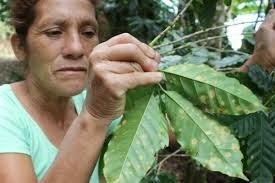 Coffee rust is a fungus that shows up as yellow patches on coffee leaves. It attacks the leaves and reduces the plant’s ability to feed itself. As a result, the coffee fruit will never mature and the harvest will be lost. Predictably, this has an impact on coffee prices, but more important, it can literally force farmers into poverty and leave them and their families hungry. In mid-2013, 437,000 coffee farmers were affected across Central America, including farmers in Guatemala, Costa Rica, Nicaragua, El Salvador, Mexico, Ecuador and Honduras---the largest coffee grower in the region. One positive exception has been Colombia, which actually saw a 26% increase in its national coffee yield year over year. The National Federation of Coffee Growers of Colombia developed a coffee rust-resistant plant strain and farmers planted it. It worked. Now---that technology needs to be transferred to other countries and other coffee farms. 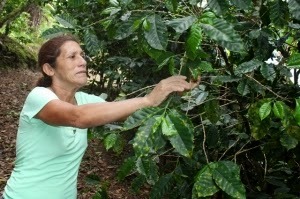 For coffee farmers like Ernestina Martinez, a widowed mother of 8, who successfully started her own farm several years ago and painstakingly got production up to 4 metric tons, the carnage of the rust-plant fungus has been harrowing. She destroyed the harvest and is looking for Plan B. She is mournful of what’s lost, but determined to keep growing. Part of enjoying coffee and all of the good health, productivity and contentment it brings is being aware of where it’s grown, who’s growing it and what hardships they face. Let’s hope this growing season brings a resurgence of yield and prosperity for Ernestina Martinez and her peers! Currently, here in the command post of International, trans-galactic, world headquarters, we're deeply into some Folgers (long live the Bourgeoisie!) which goes very nicely with Christmas Lounge, thank you very much.